Remove orange cap and insert cartridge into your printer. NOTE: ‘Counterfeit cartridge’, ‘Fraud cartridge’ and ‘Non-HP cartridge’ alerts are COMPLETELY NORMAL for all HP 902, 902XL ink cartridges which have been refilled and first installed into the printer. 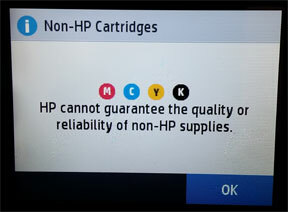 You may observe these one-time error messages after the ink cartridge(s) is initially installed into the printer – you may bypass/ignore these messages by selecting ‘OK’/’CONTINUE’, etc. Your printer/computer may show an “Used HP Cartridge” message. Press ‘OK’ to dismiss this prompt. Additional alert messages, such as “Used HP Cartridge”, “Non-Genuine Cartridge”, “Non-HP Cartridges” or “Counterfeit”/”Fraud” may also be displayed. Press ‘OK’ or ‘Dismiss’ to bypass these prompts. 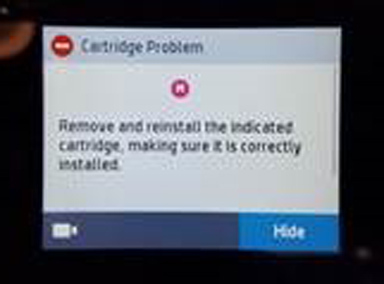 For HP 902, 902XL cartridge errors such as “Cartridge Problem”, “Missing or damaged”, “Cartridge Error”, “The following cartridges are not intended for use in this Printer”, etc. 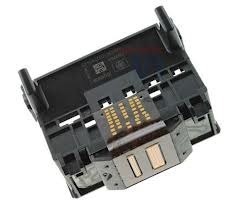 then the printer is not recognizing the cartridge’s ‘smart chip’ which is affixed to the rear side of cartridge or the ink cartridge’s plastic tab is not properly locking the cartridge into the printer’s PRINTHEAD assembly. If the HP cartridge error condition persists (i.e. ‘missing or damage’ errors, etc.) then the error may be caused by cartridge to printer connectivity. 1) Ensure cartridge is fully locking into position and cartridge’s plastic tabs are properly aligned – pull out on latch to ensure it is extending away from cartridge body. Be careful not to bend the tab out more than 1.27 cm (0.5 inches). Moving the tab too far might damage the cartridge or cause the tab to break off. 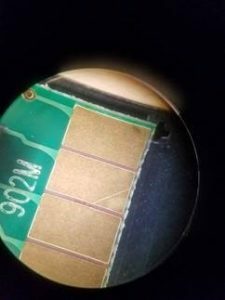 2) The issue may be caused by a slipped or skewed chip issue. 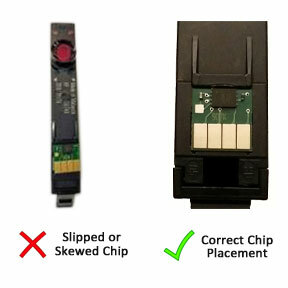 Remove the refilled cartridges and inspect cartridge’s smart chip for proper placement and alignment. Return cartridge to refill lab if this condition is present. 4) Install brand new HP original cartridges to completely rule out the refilled cartridge/chip detection issue. 5) If a cartridge detection issue continues, return to ink refill lab and request to have the cartridge/chip evaluated. 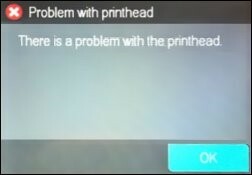 “Printhead Failure, “Problem with printhead“, “Ink System Failure” or “0xc19a0020” printer errors typically indicate there is an electrical problem with the internal PRINTHEAD or with PRINTHEAD connectivity (i.e. there is an alignment problem with the internal PRINTHEAD, it may have ingested air from one of the ink cartridges or it has electrically failed) but it could also be caused by a simple mis-alignment (skew) of a cartridge’s smart chip. It is first suggested to return your ink cartridges to your ink refiller and request to have them weighed to ensure an adequate amount of ink is inside. Turn the printer on; open the printer to access the print cartridges. Remove the suspect cartridge(s) from the station. Re-install the cartridges in their stations. Turn off the printer for 30 seconds and then turn it back on. Print a test page following your printer’s instructions. If this does not work, please proceed to step 2. 2.a. If the cartridges have been evaluated and step 1 above completed, if the problem continues perform a “printer reset”. 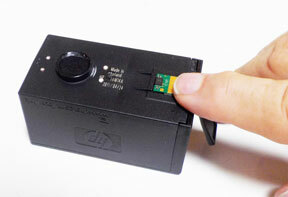 This can correct an electronic flag setting inside the printer telling it that the print cartridge is problematic. Often times it simply involves turning off your printer and unplugging it for at least 30 seconds. 2.b. Perform Semi-Full printer reset. 2.b.2. The ‘ENGINEERING MENU’ should be displayed. 2.b.3. Select ‘RESETS MENU’, press OK.
2.b.4. Scroll to “Semi-Full Reset” and select OK to reset the printer. NOTE: For erratic printer operations, this might return the printer to normal operations. 2.c. Print a test page to determine if the problem has been resolved. 2.d. If a printing-related problem persists, refer to Step 3. If you observe substandard print quality from your printer and you have already performed ‘nozzle checks’ and multiple ‘printhead cleaning’ procedures, then activate the Tap 41 PRINTHEAD Health Diagnostics Test to check the electrical health of the built-in printhead assembly. 3.b. The ‘ENGINEERING MENU’ should be displayed. 3.c. Select ‘SERVICE MENU’ to gain access to various diagnostic printer tests. 3.d. Scroll to ‘Special Reports’ menu and select “Print-mech button tap” menu. Enter ‘code=41’ by increasing the values using the arrow keys. When code = 41 is displayed, then select OK.
3.e. A special service test report should begin to print in black ink. Check the 4th line from top of the printed page, ‘Pen Status’ should state “Pen OK” (printed out as ‘Pxx Sxxxxx‘ stating Pxx Ox‘). If ‘Pxx Bxx‘ (Pen Bad) is displayed then the internal PRINTHEAD has electrically failed. 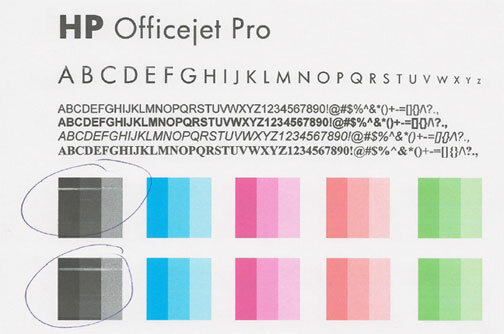 If you observe missing colors or poor image quality then air may have been accidentally ingested into the ink lines between the cartridge(s) and PRINTHEAD. To recover from this problem, you will have to run the “Clean Printhead” procedure 2-3 times to recover the ink system. This type of problem is common with older printers but is completely recoverable. For refilled HP 902 cartridges which are not in use, ensure the orange protective cap is securely attached to bottom of cartridge (covers ink spout) to prevent cartridge from drying out. CAUTION: If the internal foam is allowed to dry out then cartridge recovery may be difficult and possibly unusable. While it is normally suggested to use tank-based cartridges one (1) year from the refill date, it is recommended to use refilled HP 902/902XL cartridges within 90 days to avoid print quality issues. The replaceable or non-replaceable PRINTHEAD will eventually fail over time with usage and age. 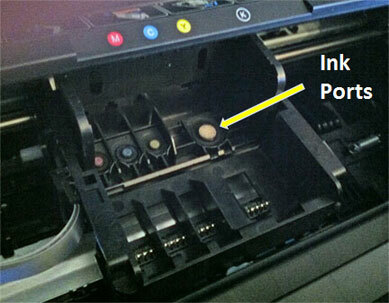 Check User Manual to determine if your printer’s Printhead can be removed/replaced. 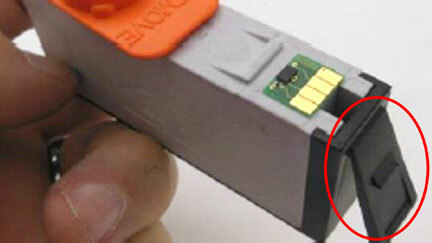 NOTE: A compatible or clone ink cartridge can be problematic; the smart chip (at base of cartridge) may not provide reliable printer-cartridge connectivity once installed. Compatible cartridges are typically purchased on-line or at select retailers (i.e sold under a different label than the regular HP cartridge packaging) and is essentially a “knock-off” ink cartridge of the HP original/genuine ink cartridge. 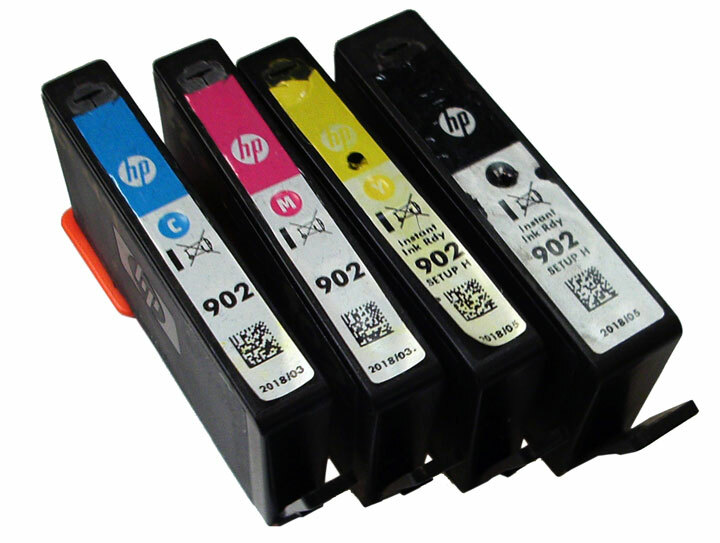 For the best refilling experience, only use HP original/genuine ink tanks which display the HP trademark logo on cartridge label.